The Green Mountain Care Board split over how UVMMC and Central Vermont Medical Center should distribute excess revenues. In a rare split vote Thursday, the Green Mountain Care Board decided 3-2 that the University of Vermont Medical Center and Central Vermont Medical Center can distribute 40 percent of their $29 million in surplus revenues to community organizations. The rest of their extra cash from their past fiscal year will be used to reduce commercial insurance rates. The plan that the board’s majority approved was essentially what hospital officials put forward two weeks ago. As partners in the University of Vermont Health Network, the hospitals submitted the proposal jointly. The board deleted a proposed $3 million investment in health payment reform initiatives, redirecting that money to rate reduction. The answer turned out to be no. Con Hogan and Allan Ramsay wanted to allow the hospitals to invest $12 million in community mental health, housing and substance abuse prevention — and they wouldn’t budge. Ramsay, a primary care doctor, said that he couldn’t pass up the chance to approve investments to address social problems that affect health. Hogan argued that the proposed social investments would address the problems that drive up medical costs and insurance rates. Betty Rambur and Jessica Holmes argued for allocating all the money to insurance rate reductions, because insurance was the source of the extra revenues. They reluctantly agreed to allow $6 million for community health, but that failed to nudge Hogan and Ramsay. 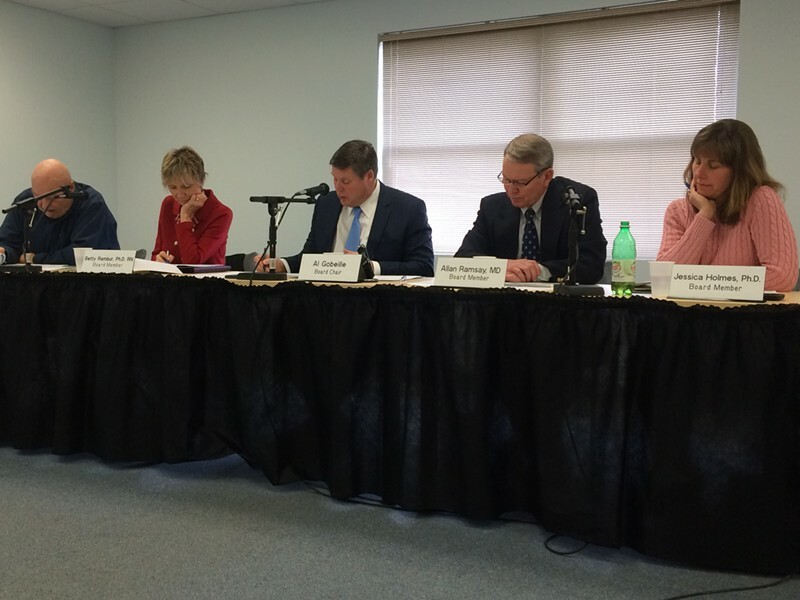 The Green Mountain Care Board looks annually at the difference between the projected budgets it approved for hospitals and their actual revenues. If variances exceed 0.5 percent, the board requires hospitals to explain. UVMMC had a 2 percent variance for the budget year that ended last October, which amounted to $22 million in surplus. CVMC’s variance was 4.2 percent, or $6.9 million. UVM Health Network officials said the hospitals saw more patients than they expected and provided less free care because more people had coverage through Vermont Health Connect and Medicaid. Rutland Regional Medical Center also had excess revenue, but CEO Tom Huebner had proposed a week ago to put all of it toward a $5 million rate reduction that would take effect May 1. The board voted unanimously Thursday to accept the Rutland plan. Gobeille initially voted against the Hogan-Ramsay allocation of $12 million for community health to try to force the board to find consensus. “We have got to come together,” he told his colleagues. When they couldn’t, Gobeille told Ramsay to propose the 60-40 split again, and that time the chair broke the tie.